I’m not sure what it is, but I’ve felt really off my game since getting back from San Francisco. I’m not motivated to cook, but then I’m frustrated with the poor food choices I make instead. Now that we’re both home and both feeling better, I’m determined to get back on track with both cooking and eating. Dinner tonight was the first stab in that direction. I halved a pint of Brussels sprouts and sauteed them with butter and garlic until golden, then added a turkey kielbasa, sliced crosswise into bite-sized pieces. The kielbasa was already fully cooked, so it only needed about five minutes to go warm and crisp at the edges. While all of this happened in one skillet, I prepared some Israeli couscous to bulk out the meal and ensure that we’d have leftovers for lunch tomorrow. Holy delicious, you guys. 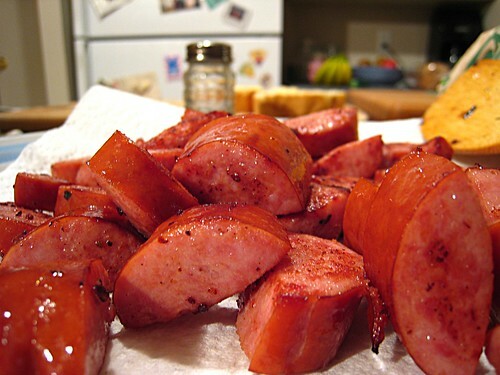 Turkey kielbasa packs most of the flavor of the traditional recipe, but with fewer calories and a lot less grease. 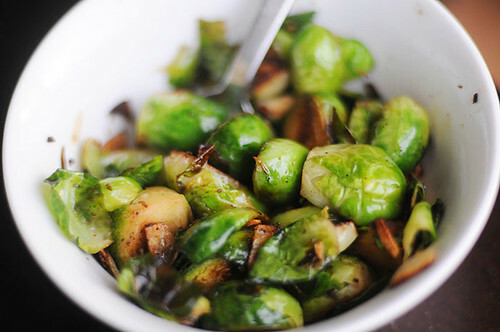 When paired with the Brussels sprouts, you get a hearty and filling dinner – that also manages to be pretty healthy. We’ll be making this again.